Cultural training and deep, nuanced understanding of Afghan politics and history were in short supply in the Army; without them, good intelligence was hard to come by, and effective policy making was nearly impossible. Human Terrain Teams, as Human Terrain System units were known, were supposed to include people with social-science backgrounds, language skills and an understanding of Afghan or Iraqi culture, as well as veterans and reservists who would help bind the civilians to their assigned military units. The shortcomings I saw in Zormat were hardly the extent of the Human Terrain System’s problems. The project suffered from an array of staffing and management issues, coupled with internal disagreements over whether it was meant to gather intelligence, hand out protein bars and peppermints, advise commanders on tribal conflicts or all three — a lack of clear purpose that eventually proved crippling. It outraged anthropologists, who argued that gathering information about indigenous people while embedded in a military unit in active combat posed an intractable ethical conflict. Once the subject of dozens of glowing news stories, the program had fallen so far off reporters’ radar by last fall that the Army was able to quietly pull the plug without a whisper in the mainstream media. She suggests that the military could – and should – have learned from its previous attempts to enlist social scientists in Vietnam, Central America and elsewhere, and points to Seymour Deitchman‘s The Best-Laid Schemes: A tale of social science research and bureaucracy (1976), which is available as an open access download from the US Marine Corps University Press here. 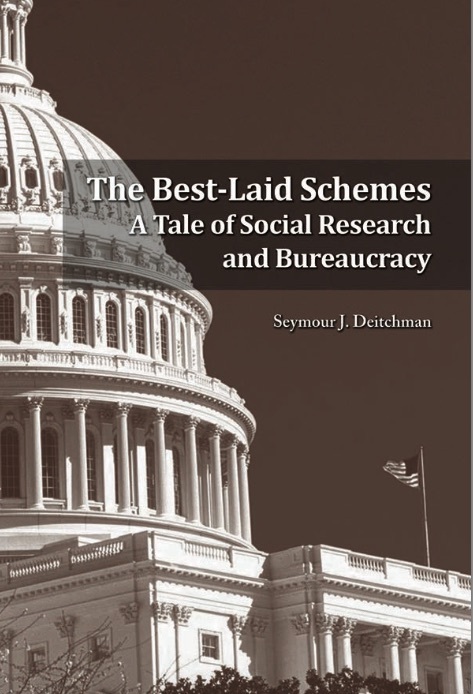 Deitchman worked for the Pentagon as a counterinsurgency advisor (among many other roles), and his account was a highly personal, take-no-prisoners affair. There’s much more in a similar vein, and not surprisingly, Deitchman’s conclusion about the military effectiveness of social science was a jaundiced one. The community of social science is likely to urge and has urged that increased government support of research on the great social problems of the day. With due recognition for the government’s need to collect data to help it plan and evaluate the social programs it is expected to undertake, I have reached the conclusion, nevertheless, that the opposite of the social scientists’ recommendation is in order. The research is needed, without question. Some of it, especially in the evaluation area, is necessary and feasible for government to sponsor. Beyond this, its support should be subject to the economic and political laws of the intellectual marketplace. And the government should do less, not more, to influence the workings of that marketplace. It should support less, not more, research into the workings of society. 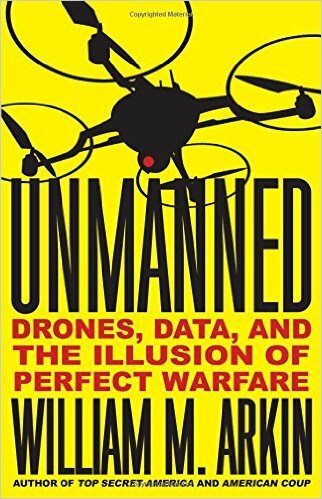 The rise of drones and sociocultural modeling, which uses data to simulate and sometimes predict human responses to conflict and crisis, have given some in the defense establishment the idea that we can do all our fighting safely, from a distance. But we’ve had this idea before, in the decades following Vietnam, and the wars in Iraq and Afghanistan should have reminded us of its falsity. 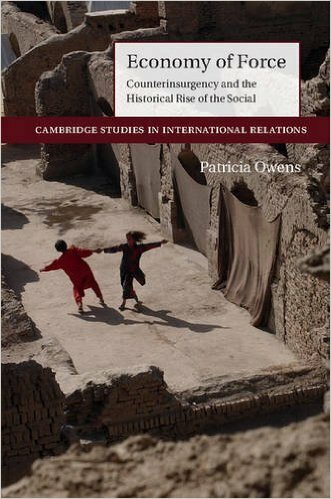 A new book from the ever-innnovative Patricia Owens, Economy of Force: counterinsurgency and the historical rise of the Social (Cambridge University Press, 2015). The book retrieves the older, but surprisingly neglected, language of household governance, oikonomia, to show how the techniques and domestic ideologies of household administration are highly portable and play a remarkably central role in international and imperial relations. In contrast to the ahistorical and anachronistic adoption of social language across IR, I think there is an important story to be told of when, where, and why the social realm first emerged as the domain through which human life could be intervened in and transformed. Economy of Force tells this story in terms of modern transformations in and violent crises of household forms of rule. 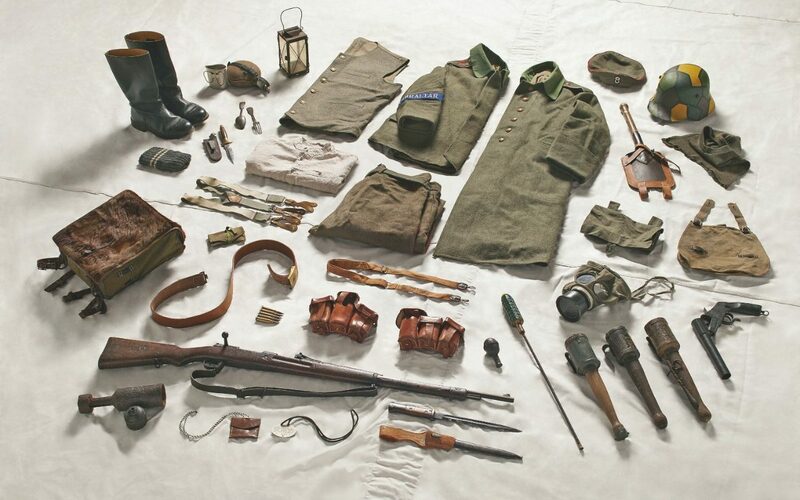 In two late-colonial British emergencies in Malaya (1948-1960) and Kenya (1952-1960), US counterinsurgency in Vietnam (1954-1975), and US-led campaigns in Afghanistan (2001-2014) and Iraq (2003-2011), so-called ‘armed social work’ policies were the continuation of oikonomia – not politics – by other means. Though never wholly succeeding, counterinsurgents drew on and innovated different forms of household governance to create units of rule in which local populations were domesticated. Military strategists conceived population control as sociological warfare because the social realm itself and distinctly social forms of thought are modern forms of oikonomikos, the art and science of household rule. 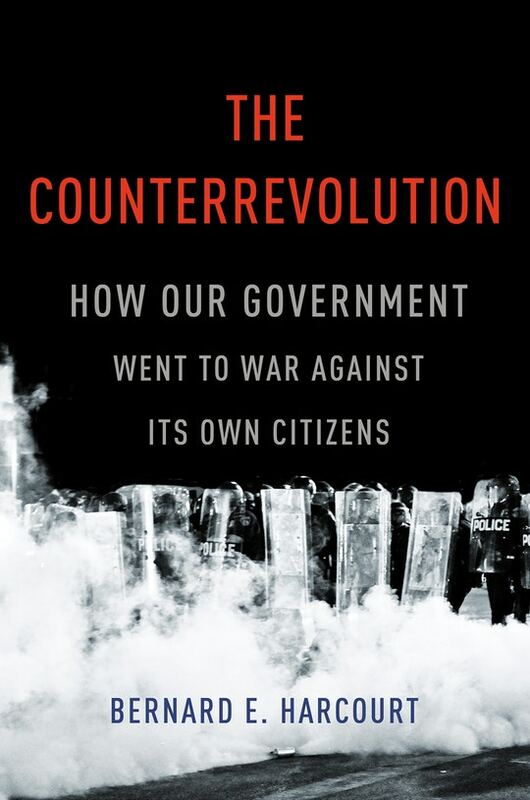 The argument has big implications for international theory, as well as the history and theory of counterinsurgency. Rather than objective theories of modern society and their interrelations, various forms of liberalism, political realism, social constructivism, and Marxism need to be situated within the history of the rise and violent transformation of the social realm. They are fragments of competing paradigms of social regulation. Ironically, the dominance of distinctly social forms of thought has obscured the household ontology of the modern social realm. Each of the major traditions is explicitly based on, or implicitly accepts, the erroneous notion that modern capitalism destroyed large-scale forms of household rule. 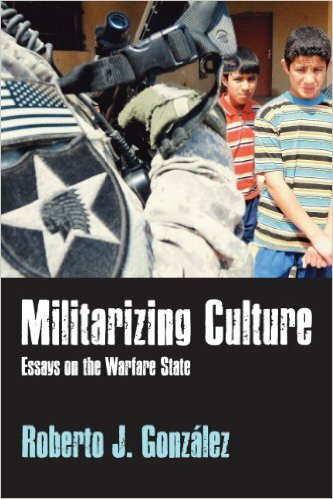 So the book not only offers a new history and theory of counterinsurgency. It offers a new history of the rise of the social realm and political history and theory of household governance. Research for the book was supported by a yearlong fellowship at the Radcliffe Institute for Advanced Study at Harvard University. There’ll be a symposium on Economy of Force at Disorder of Things later in 2015. 3. Out of the confines of the household? 8. Conclusion: ‘it’s the oikos, stupid’. You can get a taste of Patricia’s argument (particularly if you shrink from CUP’s extortionate pricing, even for the e-edition) in her ‘Human security and the rise of the social’, Review of International Studies 38 (2012) 547-567 and ‘From Bismarck to Petraeus:the question of the social and the social question in counterinsurgency’, European journal of international relations 19 (1) (2013) 139-161. I’ve just heard from Patricia, who tells me that CUP will publish Economy of Force next year in paperback (which ought to make it much more accessible); she’s also made available the proofs of the Introduction on her academia.edu page here. 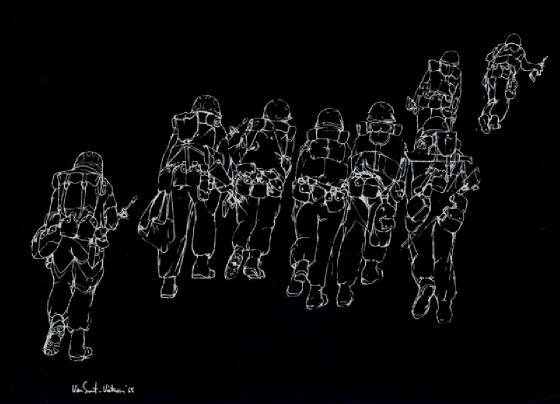 It’s been an age since I looked at the US military’s attempt to ‘weaponise culture’ in its counterinsurgency programs (see ‘The rush to the intimate’: DOWNLOADS tab), but Roberto Gonzalez has kept his eyes on the ground – or the ‘human terrain’ (I’ve borrowed the image above from Anthropologists for Justice and Peace here). 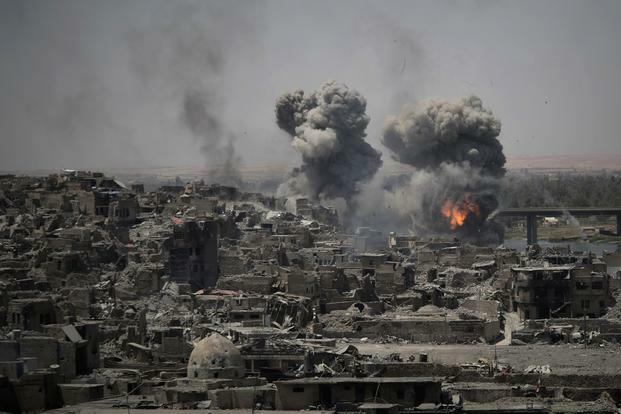 HTS supporters frequently claimed that the program would increase cultural understanding between US forces and Iraqis and Afghans–and therefore reduce American and civilian casualties. The program’s leaders insisted that embedded social scientists were delivering sociocultural knowledge to commanders, but the reality was more complex. HTS personnel conducted a range of activities including data collection, intelligence gathering, and psychological operations. In at least one case, an HTS employee supported interrogations in Afghanistan. The program had its critics, inside as well as outside the military, and US Army Training and Doctrine Command (TRADOC) eventually confirmed that HTS had been terminated on 30 September 2014. In his report, Roberto traces the rise and fall of HTS, and attributes its demise to US troop withdrawals from Iraq and Afghanistan, the fall from grace of the ‘new’ counterinsurgency’s champion David Petraeus, the incompetence of many of the HTS teams, and – crucially – to the precipitate shift from ‘cultural’ to geospatial intelligence. 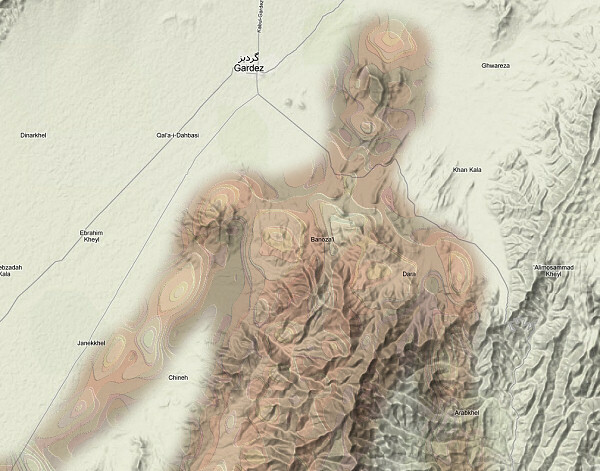 I’ve been exploring this shift in my ‘Dirty Dancing’ essay – in relation to the American production of the Federally Administered Tribal Areas of Pakistan as a space of execution, a code/space in which data surveillance and computational methods are activated to assert an extra-territorial claim over bodies-in-spaces – but it’s become clear to me that this continues to rely on (and in some respects even extends) the weaponisation of culture. It’s an appropriate metaphor: after all, weapons are inherently dangerous, they can be misdirected, they do misfire and they can cause grievous harm far beyond their intended target. 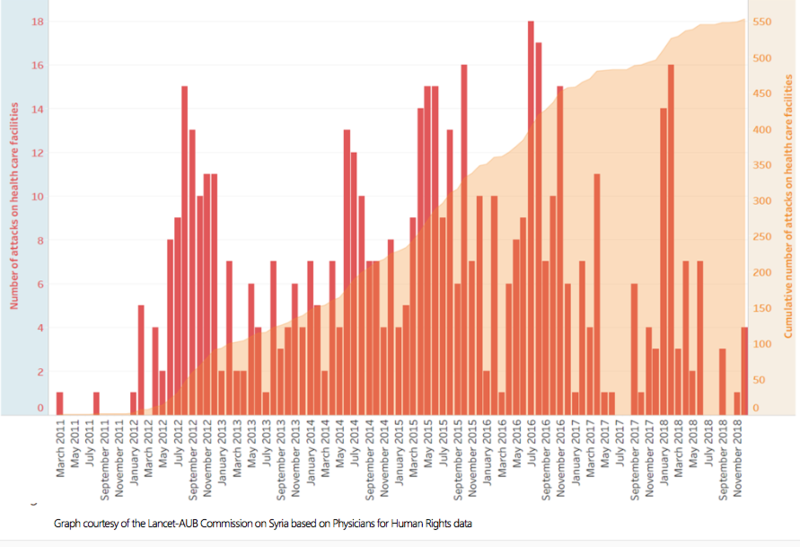 The gaps in military knowledge that HTS claimed to fill still remain. The desire to weaponize culture is as old as dreams of counterinsurgency, and such dreams do not die easily. 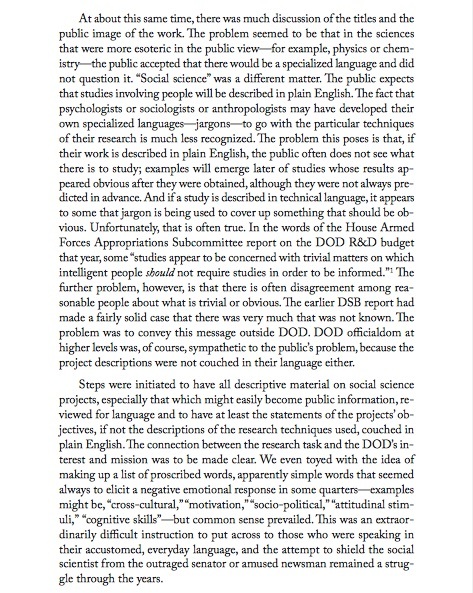 Roberto also provides a more detailed analysis of the US military’s investment in socio-cultural modelling and (this is truly vital) predictive forecasting in two linked essays on ‘Seeing into hearts and minds’: Part 1 is ‘The Pentagon’s quest for a social radar’, Anthropology Today 31 (3) (June 2015) 8-13 and Part 2 is ‘‘Big data’, algorithms, and computational counterinsurgency, Anthropology Today 31 (4) (August 2015) 13-18. 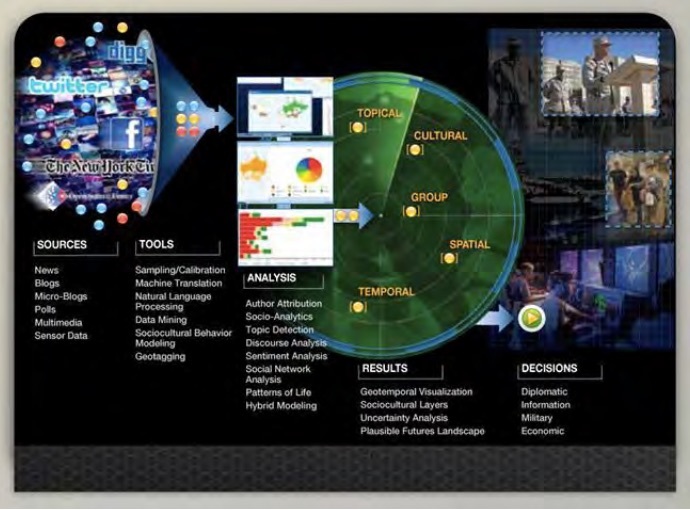 The second part is most directly relevant to what I’ve been working on because it describes the conceptual development of so-called ‘Social Radar’ (see image above: ‘sensor systems for the 21st century‘; see also here) and the morphing of the NSA’s Real Time Regional Gateway for Iraq – which integrated data surveillance from multiple sources and domains with visual feeds from drones – into Nexus 7 in Afghanistan. Today, the Data Machine doesn’t care where it is fighting. It doesn’t matter whether targets are hiding in Hindu Kush caves or in villages of the Fertile Crescent. Nor does Predator care, or Reaper, or Global Hawk, or any other of our other aptly and awkwardly named all-seeing eyes. In fact, they don’t care about anything: they are machines. But the men and women … behind the entire Machine also don’t care, for every place is reduced to geographic coordinates that flash across a screen in seconds. Nations, armies, and even people are reduced to links and networks. Loitering drones and geolocating weapons just need the data. Everyone needs the global information grid and the Internet—or, more precisely, an internet. Actual battlefield geography and culture have become immaterial. The node and the network sentry become the determinant and the provocateur of action—all the way to the edge of the world, anywhere. 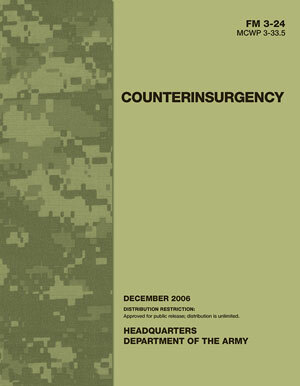 When the US Army and Marine Corps issued their revised Field Manual 3-24 on Counterinsurgency in December 2006 there was an extraordinary public fanfare: a round of high-profile media appearances by some of its architects (you can watch John Nagl with Jon Stewart here) and, even though you could download the Manual for free – there were two million downloads in the first two months – the University of Chicago Press rushed out a paperback edition that hit the best-seller lists. 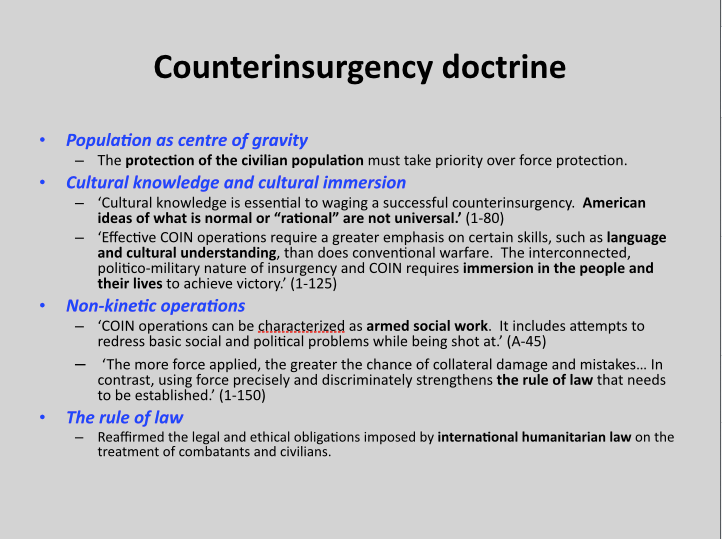 This was all to advertise counterinsurgency as what David Petraeus called ‘the graduate level of war’ and to inaugurate what I called, in ‘The rush to the intimate’ (DOWNLOADS tab), the US military’s ‘cultural turn’. And as the media campaign made clear, it was also about the production of a public that would rally behind the new strategy to be put to work in Iraq. 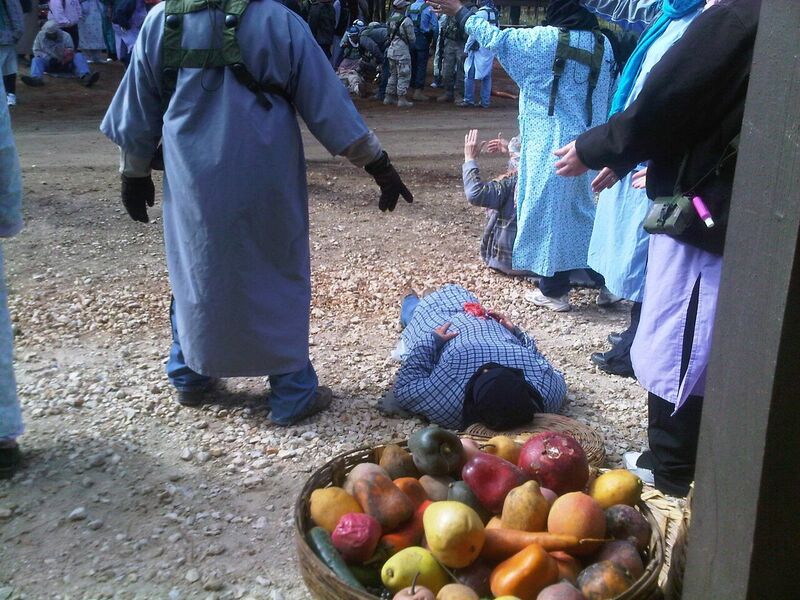 The message was that the military had put the horrors of Abu Ghraib behind it – which were in any case artfully blamed on ‘rotten apples’ rather than the political-military manufacturers of the barrel that contained them – and was now marching beneath the banner of a kinder, gentler and above all smarter war (see my summary slide below). The new doctrine, first field-tested in Iraq and then applied to operations in Afghanistan, was not without its critics, both inside and outside the military. Insiders complained that this was all smoke and mirrors – or more accurately, perhaps, too many mirrors and not enough smoke – because it was a distraction from the ‘real’ (the implication was, I think, ‘manly’) business of war-fighting, while outsiders objected to its weaponisation of culture and to the biopolitical project that it sought to advance. The debate grumbled on, and many insiders insisted that COIN was dead and buried, interred in the killing fields of Afghanistan. But a revised version of the doctrine has now been issued. It was trailed by the Joint Publication 3-24 on Counterinsurgency last December (issued by the Army, Marine Corps, Navy, Air Force and – interestingly – the Coastguard Service), which you can download here (for an early review, see Robert Lamb and Brooke Shawn‘s ‘Is revised COIN manual backed by political will? here). 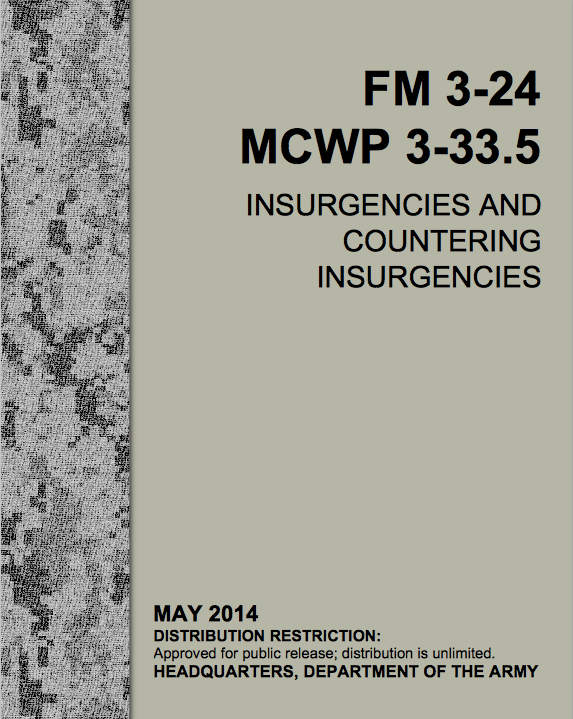 But the new Field Manual has been comprehensively re-written and even re-titled: Insurgencies and countering insurgencies, which you can download here. I’m still interested in how the revision treats ‘culture’, of course, but I’m also keenly interested in the discussion of ‘intrastate war’ and insurgency, the direct incorporation of air power (which was relegated to an appendix in the previous edition), the attention paid to intelligence in it multiple guises, the role of biometrics (biopolitics again!) – and in that remarkable last chapter. One of the central diagnostics of later modern war, in my view at any rate, is its reflexivity. You can see that in the discussions of assessment and reassessment in the new FM 3-24 (Ch 12 in particular), but attention to metrics and ‘lessons learned’ is hardly novel even if the means of monitoring have changed. 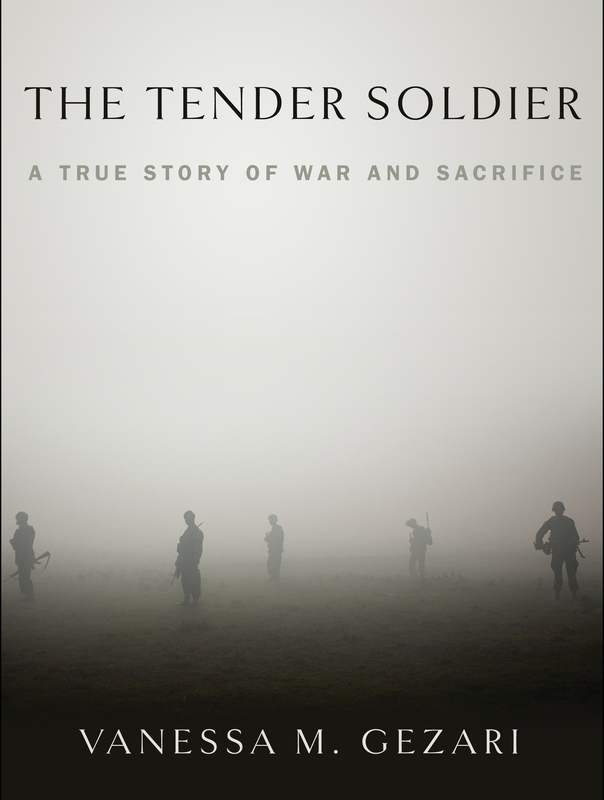 What I have in (closer) mind is a preoccupation with the public reception of military operations and military violence – which involves a distinctive emphasis on its intellectual provenance (‘the graduate level of war’ again), on media strategies (‘strategic communications’), and on the provision of a legal armature that works to inform and legitimate its operations (hence that last chapter). I’m sure the new manual will be the subject of intense discussion over at the always provocative and thoroughly indispensable Small Wars Journal (see, for example, Bing West‘s opening salvo here and David Maxwell‘s more measured critique here), and elsewhere too, but I doubt that it will attract the public fanfare FM 3-24 received in 2006-7. We’ll see.